The word holistic is defined as, “incorporating the concept of holism, or the idea that the whole is more than merely the sum of its parts, in theory, or practice.” At Connected Chiropractic, we couldn’t agree more, and we’ve based the philosophy of our practice around just that concept. When we provide patient care, we focus on the entirety of the body, not just one part. That’s because the human organism is intricately interconnected, and pain that occurs in one location can ripple outwards and have effects in other locations. Our chiropractic care strategies are based on treating the whole person. Chiropractic Care – We utilize cutting-edge chiropractic techniques to help patients get relief from and migraines, neck and back pain, sciatica, and other related conditions. Additionally, it’s used to prevent future injuries, enhance the range of motion, and boost wellness and overall quality of life. 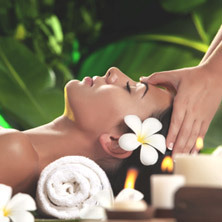 Massage Therapy – It’s true that a good massage can be highly relaxing. But it can also help you to achieve higher levels of balance and health, reduce swelling, and relax your muscles. We create an individual massage and muscular therapy plan tailored to address the specific health goals of the patient. Wherever you happen to be on the health continuum, we’ll be there to offer the support you need. For more information or to schedule an appointment with our chiropractor, contact us today.